Welcome to aquachemie.com - Water and process treatment, Chemicals Dubai. AquaChemie GT LLC was established in 2008 as a Limited Liability Company to run its operations from Dubai, for Middle East Market. 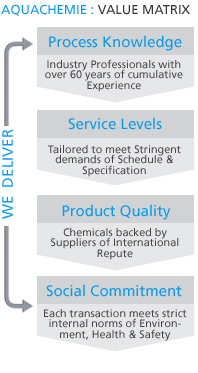 AquaChemie provides quality products (mainly commodity & semi specialty chemicals) and services. It engages itself only with Customers & Suppliers of International repute. AquaChemie's biggest asset not only lies in product and services but also in its PEOPLE. The core strength of the organization relies on its people who bring in a vast experience, based on their past of having worked with Fortune 100 companies. It is a great value and a huge competitive edge, while dealing with customers.